Mutable Instruments Shades provides 3 channels of audio/CV processing which can be configured as active attenuators or attenuverters. A bicolor output monitoring LED is available for each channel. Jumpers at the back of the unit allow each input to be optionally normalled to either a +5V or a +10V precision voltage reference. 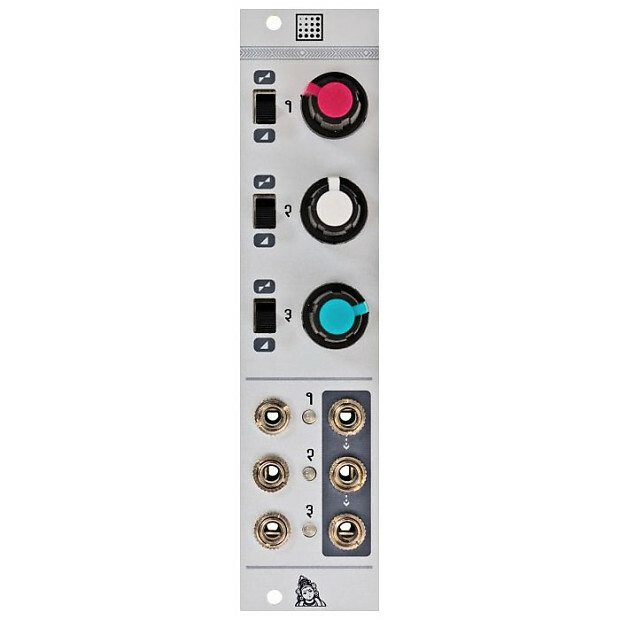 Normalling on the outputs allow the module to be used as a mixer: when no jack is inserted in an output, the signal from this output is summed into the next output. Combined with the internal voltage references, this allows the module to be used as a CV offset control. Free shipping with tracking to the continental United States unless otherwise noted. Alaska, Hawaii, and international shipments may incur additional charges. We do our best to help you choose the perfect gear, but if you don’t love it in the first 30 days after receipt, please contact customer service for a return authorization. Contact customer service Monday-Friday from 10 AM and 6 PM Eastern Time. Email customerservice@vintageking.com or call 888.653.1184, and press 2. If outside the United States please call 1.248.591.9276. Keep all packaging in like-new condition. Open packaging gently and carefully. - When opening package use scissors and try avoid tearing packaging. - Take note of how components are packed. Keep all items in new condition unless 100% sure you’re keeping the gear. - Avoid scuffs and scratches in handling and rack mounting. - We recommend rack mounting only after you’re certain you’re keeping the gear. - If rack mounting, use plastic washers and beware of metal rack screws’ tendency to scratch rack-mount holes. Include everything that came with your purchase. If equipment or accessories are damaged or missing, a re-stocking fee will apply upon return. - Contact Vintage King to obtain a Return Authorization (RA). - Place a copy of the RA inside the package of the items for return. - Write RA number anywhere on your airbill, not on the box or packaging. - Returns must be complete including accessories and documentation with original packaging. - You are responsible for return shipping costs including shipping insurance which is recommended to protect your items, as you are liable for items damaged during return shipment. Remember you own it until we receive it. - Obtain a tracking number to provide proof of your return before the end of the 30-day grace period in order to avoid a re-stocking fee. We will inspect your return once it’s received. If you have met the above conditions and the items are all in like-new condition, you will get your choice of a full refund or credit on account. - If any of the above conditions are not met, Vintage King reserves the right to charge a fee equal to our costs to return the item to like-new condition. - NOTE: If you received Free Shipping on your order, the value of the uncharged shipping cost will be deducted from your refund or credit. Important: In order to avoid unnecessary duties or taxes when returning your item(s), you MUST use the customs and shipping documents Vintage King provides along with your Return Authorization. Vintage King will refuse shipment of items when customer fails to use Vintage King provided customs and shipping documents or returns items without prior authorization. All costs are the sole responsibility of the customer. We will inspect your return once it’s received. If you have met the above conditions and the items are all in like-new condition, you will get your choice of a full refund or credit on account. If any of the above conditions are not met, Vintage King reserves the right to charge a fee equal to our costs to return the item to like-new condition. Note: we reserve the right to deny any return to any customer if there is any history of abusing the Vintage King return policy.